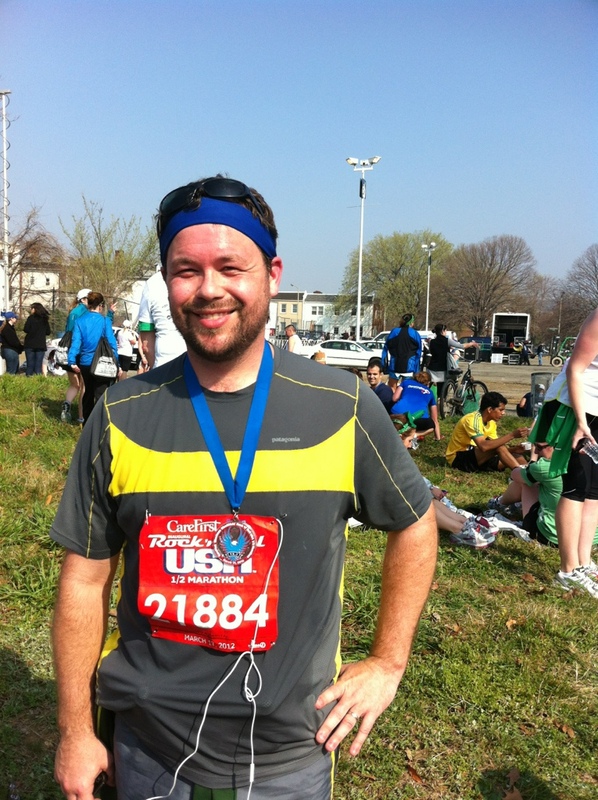 My husband guest blogs about his 1st Half Marathon- The Rock n Roll Half in D.C.! Congrats, Mike on running a great race and beating your goal time! First things first. I did it. 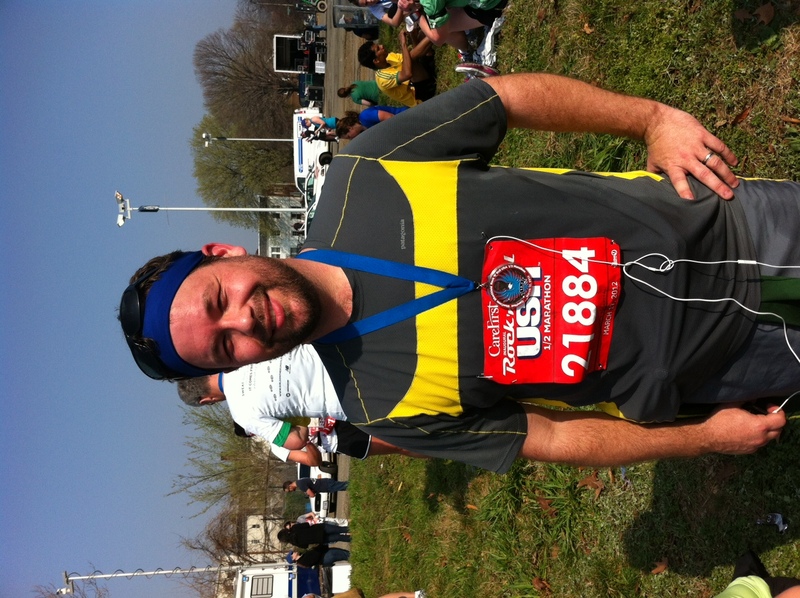 And … I beat my goal of 2:15 by nearly 6 minutes! Woo hoo! It was warm. It was hilly. But I have to say it was pretty exciting to cross that finish line. Nothing quite like it. After the debacle in my last longish distance race – read about it here, here, and this post from Kate – the Rock and Roll USA Half Marathon was absolutely incredible. It was absolutely clear that these folks know what they’re doing. The course itself was beautiful. 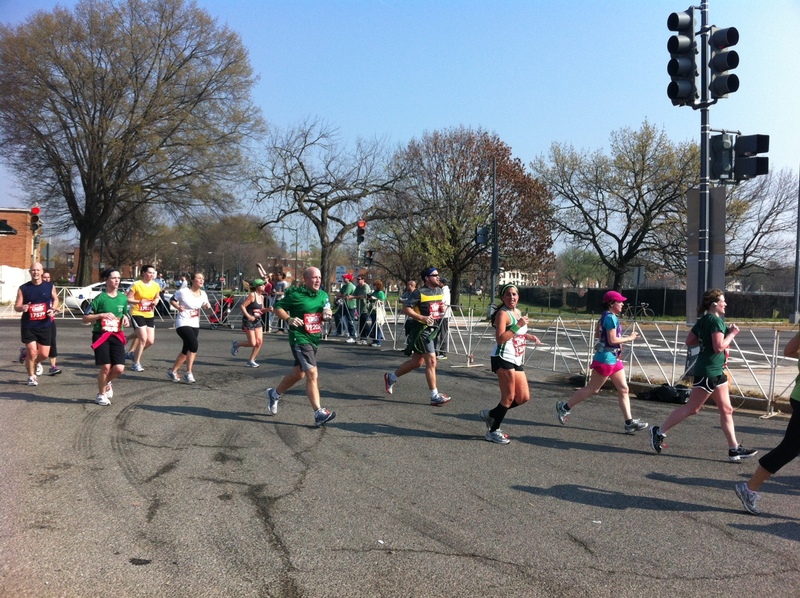 We ran though Capitol Hill with families cheering us on from their stoops and sidewalks. We ran past Union Station and had Pennsylvania and Constitution Ave. all to ourselves. 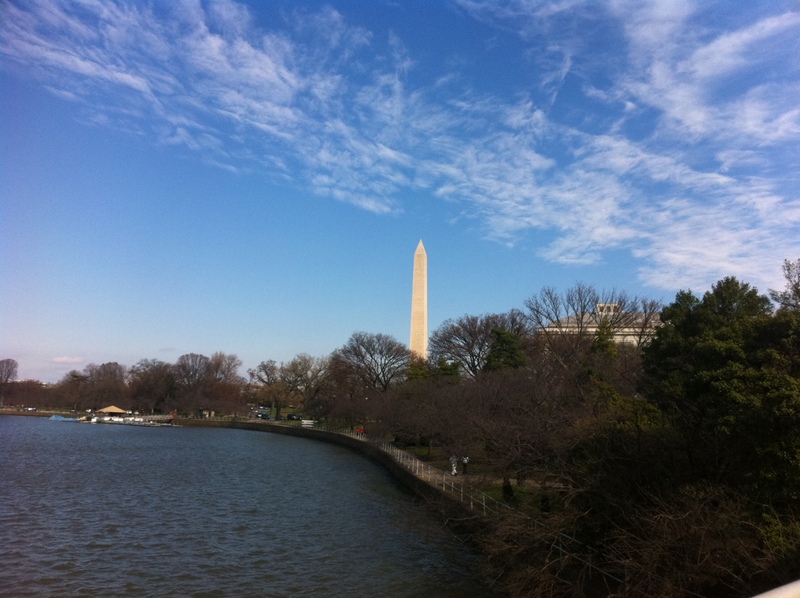 We climbed up Connecticut Ave. to DuPont Circle and through Adams Morgan – where of course people were handing out cups of beer (I passed) – and then past the McMillian Reservoir and right down North Capitol with the Capitol dome gleaming in the background. Then we cranked out the last few miles along H Street. While the race was crowded, the course was wide enough to not feel uncomfortable. The organizers did a great job shutting down entire streets. There were so many water and Gatorade stops, at least one every two miles, that I actually passed up a few. And the volunteers were more than prepared. It was terrific. I always run with my headphones (I hate to hear my feet hitting the pavement) but turned them down a little to listen to the bands placed along the course. My highlight was making a turn on Harvard Street after about mile 9 and hearing a cover band blasting Journey’s “Don’t Stop, Believin” just when a lot people probably were. Hilarious. Some people were saying the course was a little too hilly, but for every hill there was a downhill that allowed me, at least, to recover pretty quickly and get back into a rhythm. The organizers also did a great job of freeing up the finish line area with a long “tunnel” to get to the recovery area. There were no back-ups or crowding at the finish. And the sponsors literally rolled out a smorgasbord of treats – bananas, Greek Yogurt, Snickers energy bars, fruit cups, chocolate milk, and huge tubs of cold water. After moving through this area, all of the friends and families greeted their runners. The only negative of the day was the Metro. Despite giving myself about an hour and 30 minutes to arrive, I arrived 15-20 minutes late because our train had to unboard due to a door malfunction and then wait 4 trains until one was empty enough for us to squeeze in. But the thousands of people who also arrived late were still able to use the restroom and find their “pace” corrals pretty easily after organizers started about 10 minutes late. And leaving the race site was just as chaotic with people jammed right up to the escalator without any Metro staff in sight. It was literally a disaster. We ended up just walking to Eastern Market and having lunch. I would definitely run another Rock and Roll Race. I had a blast. Mike rocked today’s half marathon with a time of 2.09! 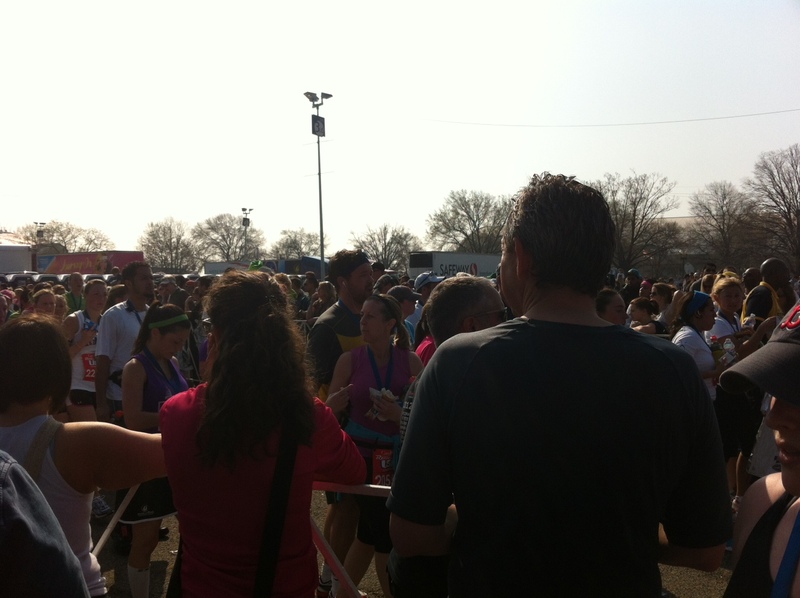 Guest Blogger: Mike Runs His 1st Half Marathon! Last May, I borrowed my wife’s Garmin and ran around the block. A whopping 0.8 miles in 12 minutes 32 seconds. It was a triumph. I was smiling ear to ear. For someone who, for 35 years, refused to do anything athletic that didn’t involve runs, points, or penalty minutes this was a real accomplishment. Looking back, it was pretty sad. It’s really embarrassing actually. 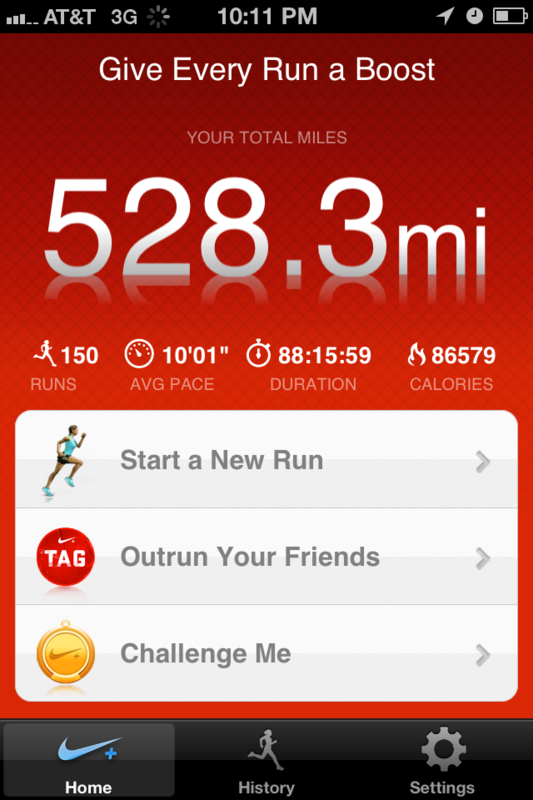 Now, let’s jump – or rather sprint – forward 528.3 miles, 86,579 calories and 150 runs later. After less than a year, I’ve managed to convince myself that running a half-marathon is a good idea. So, on Saturday, I’ll run my first half-marathon – more than 16 times around that same block – and I couldn’t be more excited. I’ve dropped 20 pounds, joined a Pacers long-run training group, bought a lot of fluorescent technical shirts and worn out four pairs of shoes. Running is fun. Running is cathartic. Running is seriously, seriously addictive. I want to thank Kate, my gorgeous wife and moderator of this blog, for asking me to guest blog about the Rock and Roll Half Marathon this weekend. I hope I can offer some insight into the course, add some commentary about the format and hopefully report back Saturday that I beat my goal of 2 hours and 15 minutes. Kate will be joining me for the last few miles. 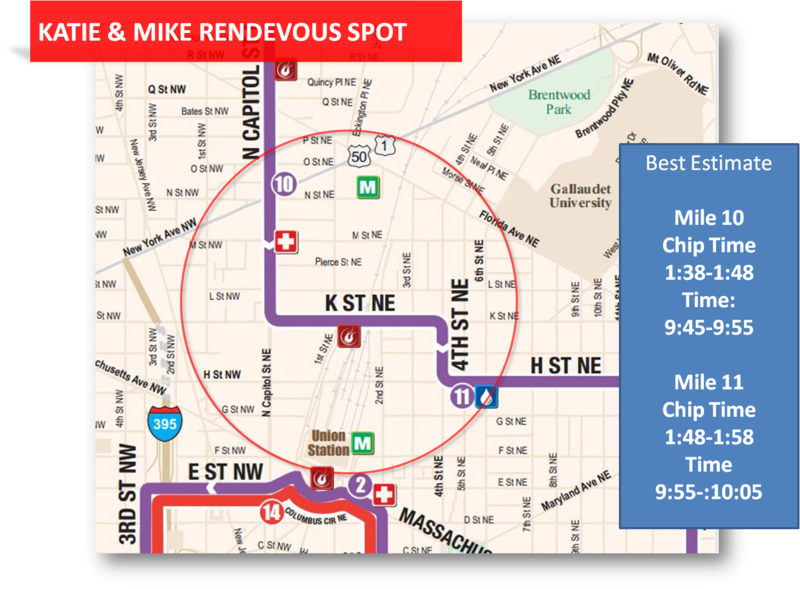 I have become such a run nerd that I made her a map with estimated times so she can find me and run me into the finish line. 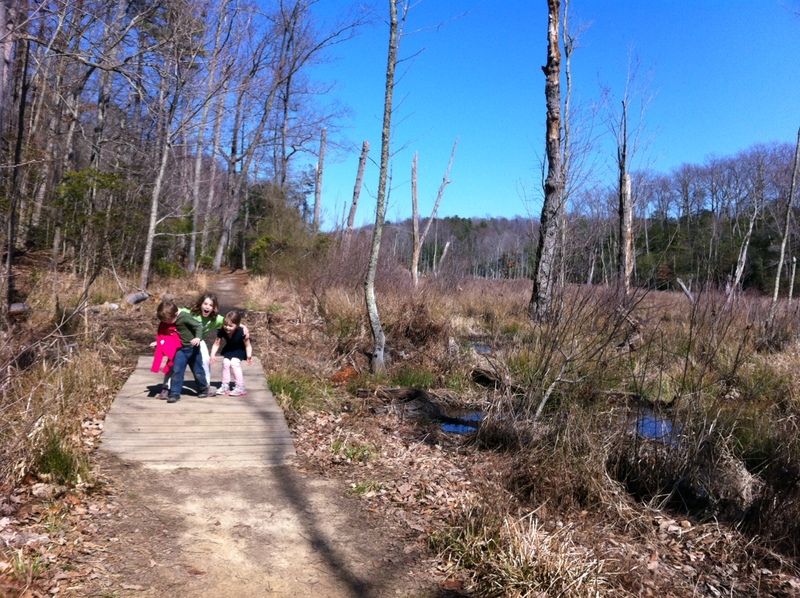 I took the day off of running to hike Calvert Cliffs State Park with my kids and sister. While we’ve spent lots of time in North Beach, Chesapeake Beach, and Deale, I’d never visited this amazing Maryland State Park. The motivation for today’s trip was fossil hunting. Calvert Cliffs is a major source of Miocene-period fossils, and the constant cliff erosion means “fresh” fossils are always washing up on shore. The park is a little over an hour drive from Washington, D.C. We took the scenic route through North Beach, but taking the Solomons Island Highway is the most direct route…just use google maps to see options from your address. Calvert Cliffs has amazing curb appeal, with a massive repurposed tire playground and a fully stocked fish pond visible from the street. Parking is no problem either, with a suggested donation of $5 per car. We took the “Red Trail” to the Chesapeake Bay beach. It’s a 1.8 mile hike (each way) on hard-packed sand/soil…very easy on the feet (we even saw a couple brave parents with strollers) and incredibly scenic. 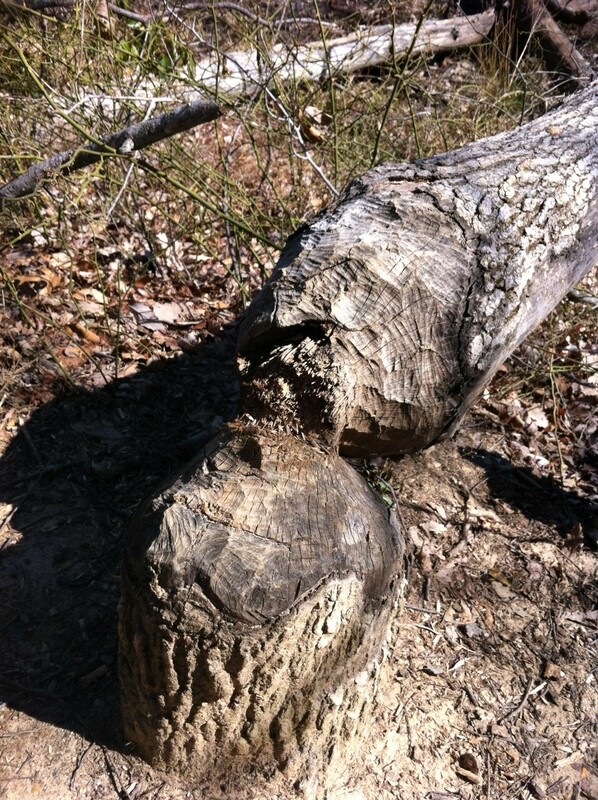 We saw lizards, turtles, and countless birds….we even found evidence of an elusive beaver. 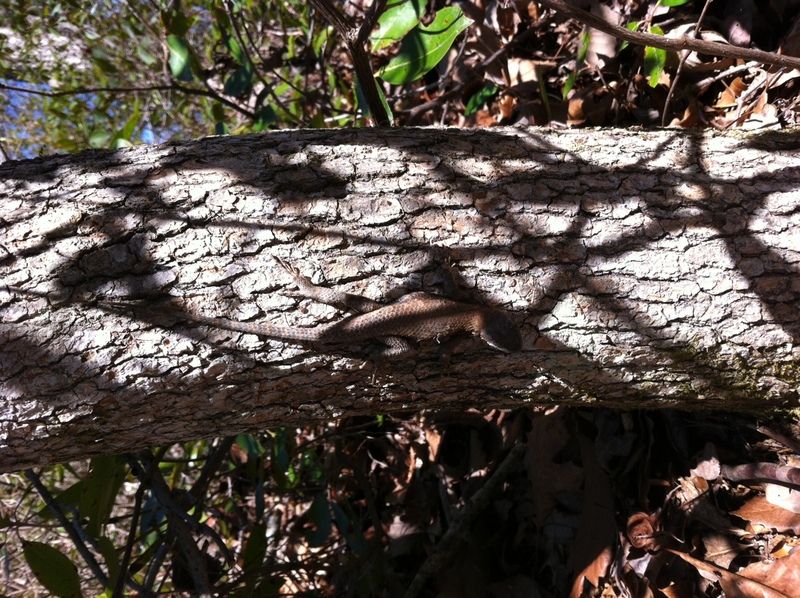 We pet this lethargic lizard! The beach (even at high tide) was fantastic; we brought a large picnic blanket and easily found a nice private spot. 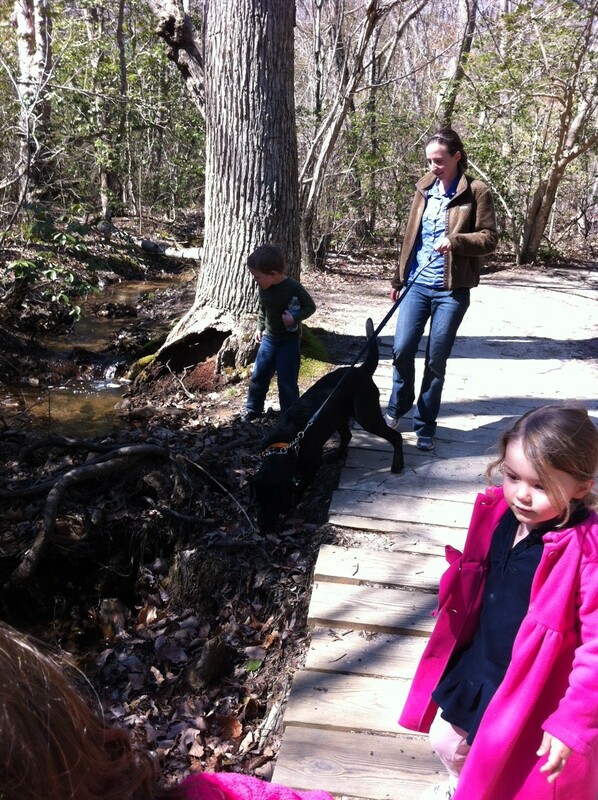 Even though the water was frigid, we took off our shoes and waded in looking for fossils. 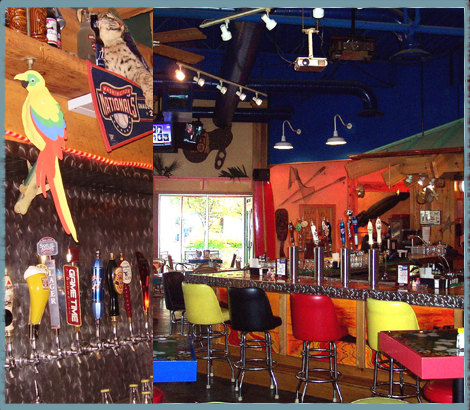 It took some time, but we finally found the fossils we were hunting for. 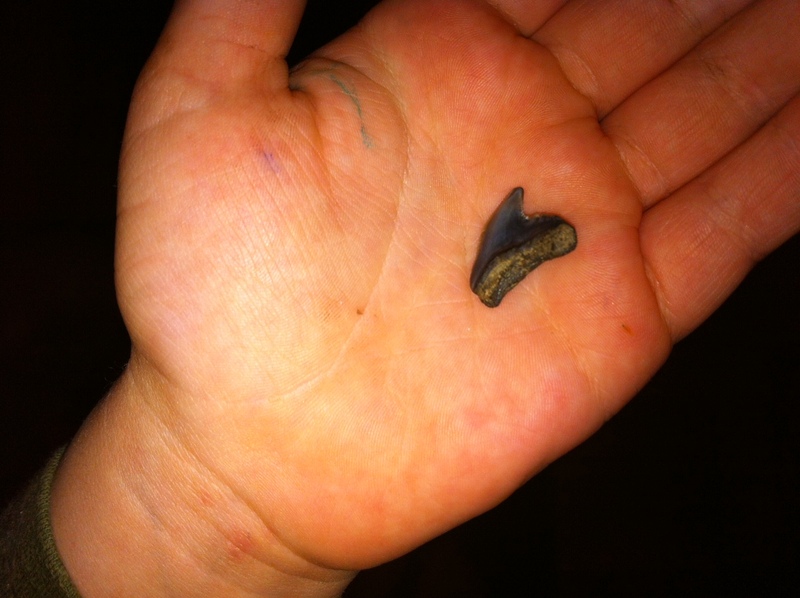 My son was the most dedicated…he kept running into the surf for handfuls of sand until he finally got a 8 million year old shark tooth. So proud! Amazing trip, and I’m already looking forward to going back to run the trails. Great run this morning, despite the cold weather and insane winds. My running partner and I did nearly 10 miles, following this route from the Iwo Jima Memorial, across the 14th Street Bridge, around Hains Point, and back over the Memorial Bridge. Although it’s one of my best-loved runs, this morning’s winds were relentless. Much of the route is unsheltered (i.e., across the bridges, along the Mt. Vernon Trail, and around Hains Point), and the wind seemed to kick up…in the wrong direction, unfortunately…whenever we hit open ground. I could have used more lip balm (this Kiehl’s is my favorite) and thick moisturizing sunscreen…my face and lips are completely chapped. Regardless it felt good getting back out there for a long run. Getting back into longer jogs also gives me the opportunity to review a fabulous product, courtesy Medi-Dyne. This awesome RangeRoller ( I LOVE the play on words) lets me give myself deep tissues massages…a must after a hard workout. Keep that blood flowing! Mine comes in this fun pink and red combo! 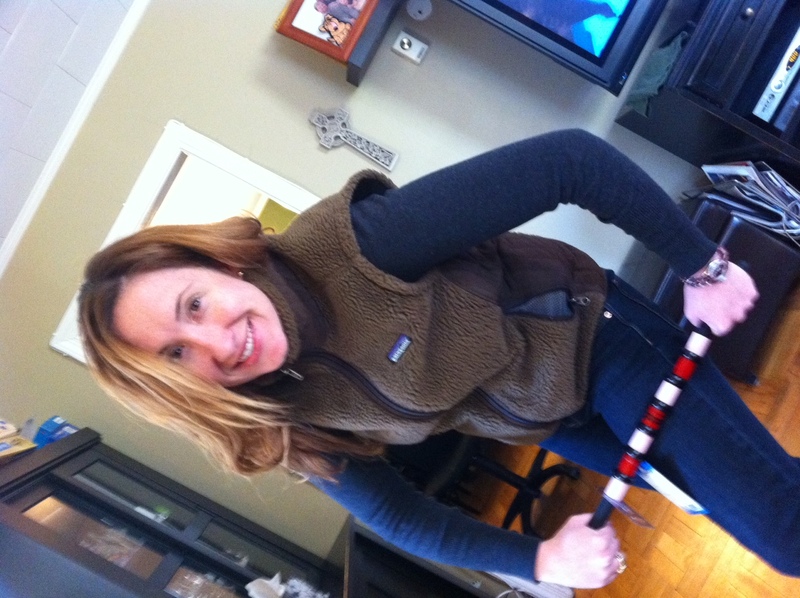 Thanks, Medi-Dyne…it’s a great tool!